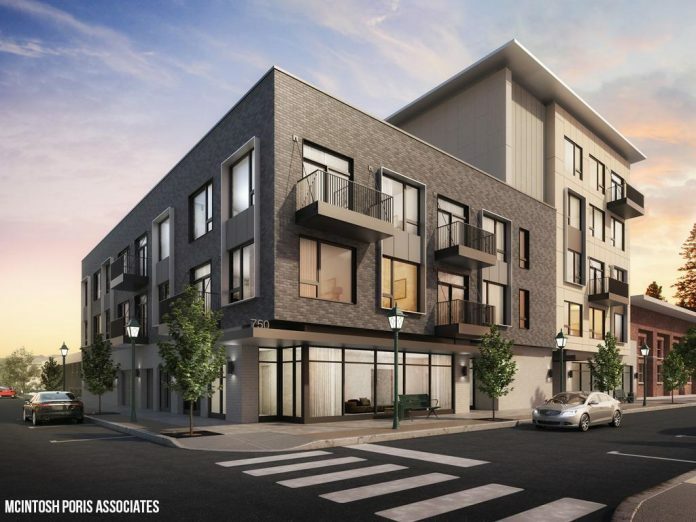 A new residential condominium development, called 750 Forest and located in Birmingham’s Triangle District, will be developed from an existing mid-rise building located at 750 Forest Avenue. The location is across the street from Forest, an upscale restaurant. The condos, to be built by Robertson Larson Group in Bloomfield Hills and designed by McIntosh Poris Associates in Detroit, will offer 1-, 2-, and 3-bedroom floor plans ranging in size from 816 to 2,294 square feet. Prices for the 22 units start at $395,900. Kitchens will feature Dura Supreme cabinets with soft-close hinges and dovetail drawers, quartz countertops, and a subway tile backsplash. Each kitchen is also equipped with Bosch stainless-steel appliances, including a refrigerator, microwave, vented hood, dishwasher, and dual fuel range. Soaking tubs, Kohler’s premium line of faucets, fixtures, sinks and water closets, Sherwin Williams paint, and acoustic insulation between all unit walls and floors are offered, as well. Personal balconies will give homeowners private outdoor access, while space available on the garage level offers a secure, climate-controlled area for storage. The rooftop terrace – located on the fourth level – will provide a space for outdoor dining and entertainment. It also includes a dog run area. Other community amenities include a professionally run homeowners’ association (HOA), monitored entry, front concierge service, high-tech security, and an electronic access system. Robertson Larson Group is a 50/50 partnership between Larson Realty Group and Robertson Brothers Homes, both in Bloomfield Hills. For more information, visit www.750forest.com.